Charity’s Cross by MaryLu Tyndall is book number four in the Charles Towne Belles series but can be read as a stand-alone as I had not previously read anything by MaryLu Tyndall. 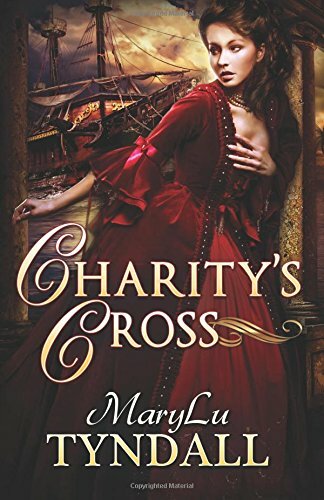 It is a Christian historical romantic adventure full of swash buckling pirates and preachers and maidens in need of rescuing. One of the main themes is that of trusting God. Charity used to trust God but life to her, seemed to show that God was untrustworthy. “She had assumed God had abandoned her years ago.” Charity feels alone and trusts no-one. She feels that she can only rely on herself, but she is wrong. God is the One she needs to lean on, she just needs to open her eyes and realise that, as she is told “All you can do is follow God the best you can an’ trust He loves you.” Will these words ever impact Charity? Tied in to trust, is that of prayer. Charity has prayed to God but He seems silent. She doesn’t recognise His hand in her life. Now she doesn’t pray. “‘We will pray for him’… ‘I don’t pray.’ ‘It doesn’t matter. '” God always answers prayers, just not always in the way we expect Him too. I am sure we can all empathise with Charity. God hears all our prayers, even the prayers we utter but don’t believe in ourselves. The blame game is another theme within the novel. “Wasn’t it human nature to want to blame some-one for life’s tragedies?” We all want some-one to blame when life is tough. We blame each other. We blame God. We blame ourselves. The blame game solves nothing but can ruin lives as we look backwards into the past with the potential to become bitter and twisted. God can use our lives to help others if we only let Him. Preacher Elias says “the world is my church.” God can take us and use us right where we are. The church is so much more than just a building. Charity’s Cross shows the very clear difference between the man who has religion and the one who knows God. Going to church, quoting scripture and saying elaborate prayers does not make one a Christian. This reminds the reader of the Pharisees who liked to make a big show of their religious practices. The man who really knows God, lives a life for God which is evident for all to see. The novel demonstrates how the sins of the fathers can continue to the next generation. MaryLu Tyndall sensitively deals with the topic of abuse, both physically and mentally. “He’d denied her nothing, save love, happiness and safety.” It can make for hard reading at times. Particularly poignant was the portrayal of how one escapes in one’s mind while the abuse is happening. God is in the business of restoration. The novel shows numerous accounts of lives transformed. “God is in the business of not only forgiveness but restoration.” Anyone can have a new start with God. Overall the novel is a good old fashioned adventure with a dashing hero, a helpless maiden and a good dose of God. I thoroughly enjoyed it. It was my first novel by MaryLu Tyndall but now I want to read more, including the first three in the series. Thank you for the lovely review, Julia. I’m so glad you enjoyed Charity’s Cross! God Bless you! I can’t wait to read the one! It has been awhile since I have read MaryLu Tyndale’s books.